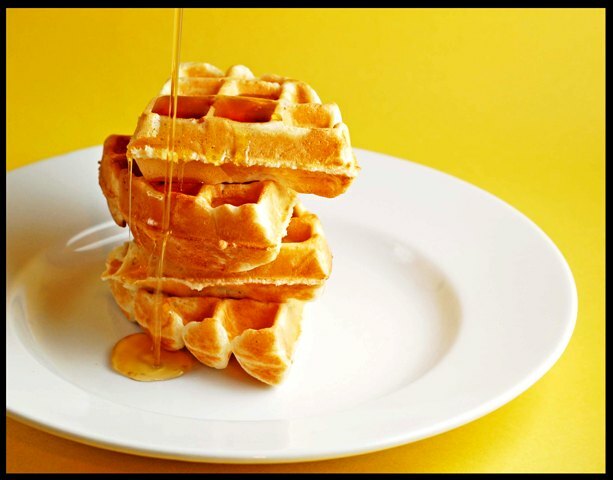 Have you ever tried Brown Butter Waffles? What? You haven’t! Then you definitely need to try out our recipe as you are in for a real treat. Browning the butter before adding to the waffle batter, gives them a slightly nutty flavor, which enhances the sweetness of the pure maple syrup. They are really good; trust us. They are great for breakfast or brunch, and even dinner. Yes, dinner! It has been a long time since I have had time to participate in the CLICK Event. The challenge this month is stacked and I knew I had the perfect stack to share! This is a really fun photography event, if you love food and taking pictures, then be sure to run on over and check it out! I had intentions of making an actual “dinner” tonight; but with packing for the weekend as well as packing the house up, I did not even have time to dial take out, let alone head to the grocery store. I had to wing it with the waffle recipe as I packed all the cookbooks; but, I have to say, they came out GREAT! Crispy on the outside and moist on the inside. Melt butter over low heat and gently brown. Mix the milk with egg yolks until blended. Add milk/egg mixture to flour and salt, stir until mixed but not over mixed. Cook waffles according to your waffle irons instructions. 3 Responses to "Brown Butter Waffles"
Drat, I clicked through rather than sign off (my computer cable is literally smoking). This looks unreal. Esp. at 12:15am. Anyway, I am sorry you have to go through the hassle of moving. Good for you for still having fun with food. Browning the butter first, that's an interesting idea to try out. Good luck with the move.